Bullets struck! The gun's rat-a-ta-tat! What a ruckus! This thunderous gat! Here's five bucks, keep it under your hat. Rufus T. Firefly (Groucho Marx) shoots his own soldiers and--at least momentarily--attempts to pay to cover it up: Duck Soup (Leo McCarey; 1933). 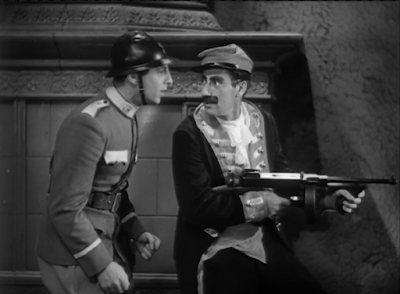 Firefly slips the bribe to his assistant, Bob Roland (Zeppo Marx).